In the millennium's last great sf novel, Stephen Baxter takes us a short step byond Y2K. The year is 2010. We have survived ... so far. 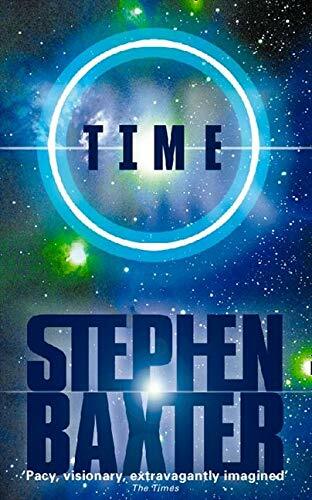 In the millennium's last great sf novel, Stephen Baxter takes us a short step byond Y2K. The year is 2010. We have survived ... so far.Cornelius Taine of Eschatology, Inc., mathematical genius, predicts that in just 200 years our species will be wiped out. Even evacuation from Earth will not save us from extinction.Reid Malenfant, entrepreneur, has Big Dumb Boosters ready to fly from the California desert, to be piloted by an enhanced squid named Sheena 5. When Taine offers Malenfant the ultimate dream of saving the species, Sheena's mission is diverted to investigate Earth's recently discovered - and very remote - second moon.What Sheena 5 discovers there is nothing less than a revelation: the secret reason for our existence visible at last beneath the rippled surface of Time's river. Malenfant and Taine must follow Sheena... but they are pursued by an enraged US Air and Space Force, and a mighty battle in space may cut short their hopes for the ultimate transformation of mankind.